Washington, D.C., July 7, 1976. Panama Canal and the Problem of Security". to the Chairman, former member of the U. S.
the security of the Canal. 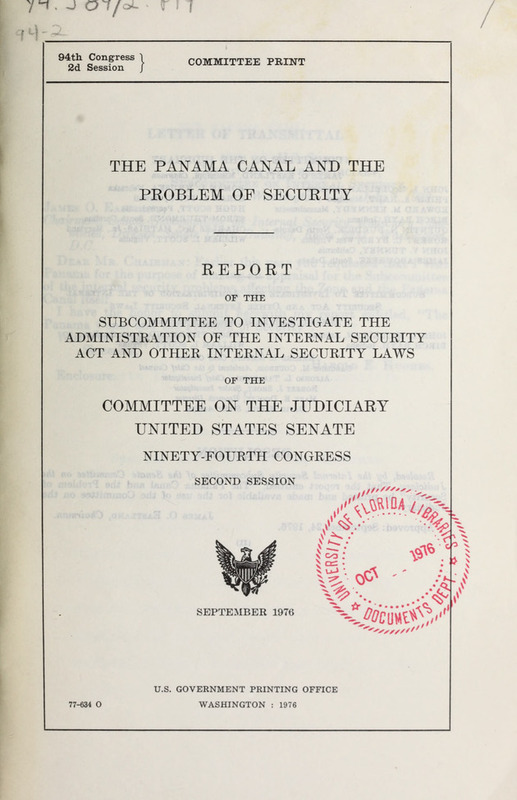 the issue of the Panama Canal. Canal after a further period of years. this dispute in one direction or the other. in the Dominican Republic in 1965.
that he had sought the assistance of the U.S.
ground or another still continue to do so. the past and smack of colonialism. uation with courage, tact and understanding. they perceive the matter, at their own expense. arate schools for Latin American students. protect the quality of the schools. cember 1979 or December 1980.
will be transferred to the U.S. schools. opportunities for Americans in the Zone. through retirements, promotions, and so on. minimal for years to come. cans could fill the many so-called "security"
calling for equality of employment opportunity. I would be inclined to agree. a major step in the right direction. ject of prolonged and painstaking deliberations. times of distress and disturbances." the schools and health services. behind price increases in other sectors. tranquility and security of the Canal Zone. than to any economic benefit. I will not suppress it." for most of its posts. demonstrated its capabilities in the past. Canal Zone is at stake. vened, the riots stopped almost instantly. Guard are the product of training in U.S.
used by the U.S. military. events were not carried by the American press. take pictures of the citations being issued. National Guard would like to have "observers"
that period of time only. in their patrol cars as "observers". repetition of such incidents since January. Zone or on the Panama side. rity Chief of the Panama Canal Zone, Mr.
police as it relates to riot control. his duties would be taken over by the Lt.
as guards at locks and power stations. early 60's on Castro infiltration in Panama. subject which are available to the Chairman. in composition and nationalist in essence." a period of two months in 1973.
to the course of violence. worked out through peaceful negotiations. political and military from Panama. that this can be done. Panamanians and the Zone authorities. capacity to respond to any need ultimately. is essential for the future. least our non-o-position of that treaty. on its face it appears to be a valid contact. Officially; most labor representatives indicate support for this annex. getting the necessary legislation for its enactment into law. into law even given that it was annexed to the treaty. in turn they the AFL would come out against the treaty. have made it our primary and total position. this part of the treaty was enacted by separate legislation. (P.L. 85-550). tion that this annex hasn't got a chance of enactment. to believe that it has no chance of being enacted into law. a.re -Z-.inct this tre-tty, as well as those that arec pro-treaty. all of these groups to get this annex e.nacted into law. of somQ throo thous-nd employees oven if you exclude the non-U.S, employees. multi-millionc over 2 protracted period. c-n oIlj entrench thum in their belif. ilMany I' ,rals also havu this buliof. It is foolish to CugeiLst tha they' jd not know. from the Civil :;irvico Coiainirulion at least. On the othiur li-nd, what c.n be lose by t Jing opposition to this trca.ty? '.Ih-.t can We ,. .ir? left up to the State Departmcnt for support in its enactment. that wo have gained the reputation, true or false, of selfish colonialists. W-thout this stigma, we would not be in the position that we aro in today. interests that will lose are the communist interests and the corrupt. lWe are using one tool, a mailing campaign, but that is not nearly enough. issues fought over between the Department of State and the Congress. blamec this body for that loss. the covert contacts from our own State Department. ball contact to change situations such as the above. one arc lost to us "jy du fault. if wo don't help fi-ght them ourselves. It takcos money oven if you lose. But if you don't oven male the effort to try we are certainly going to lose. problems can be put off until tomorrow. all bencfited front the several trips that this Union has made to Uashington. both hire and in the States. You have refused to support this organization. your chances in rspn.ct to the labor annex. lobbied the Congress and national Labor for support on their position. Tice last tool we have, ..nd the most formidable, is the truth. are buing misleri and nisinforr- icd. y-u to ui-Jk out for yourself, h foro it is too late, thu truth of the matter. This Union can no loii,-c:r b bur luiinud by huoit-ition, inactivity, -nd suspicion. size that there is just not enough tint for all of this. this matter based on uxporioncQ. I loavo it up to you to mnakeo your decisions. forceful, and decisive will inherit the fruits of the nook.